And no matter what may come as we journey on together . . . know that deep within my heart, I will love you . . . forever. I absolutely adored this wonderful picture book and feel sure I wouldn’t be able to read it out loud without crying. There are several things that make this book stand out. First of all, since Dodd uses animals to tell her story, the characters don’t have names or genders, making it perfect for any combination of parent/grandparent/caregiver and child to share. Secondly, the rhyming verse will appeal to little ones and the sentiment will appeal to both children and adults. I would be remiss if I didn’t mention the beautiful illustrations in this book. They speak volumes with their simplicity and the use of shiny foil on several pages is sure to appeal to small children. I think Forever is the perfect addition to any nursery library. I know I’ll be giving it as a baby gift in the future. Be sure to check this book out if you have any little ones in your life. I will link this up to Booking Mama’s Saturday feature, Kid Konnection. 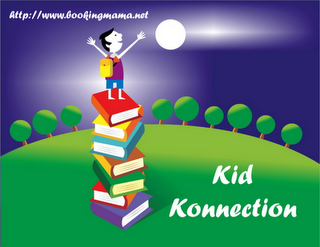 If you’d like to participate in Kid Konnection and share a post about anything related to children’s books (picture, middle grade, or young adult) from the past week, leave a comment as well as a link on her site tomorrow. Review copy provided by Candlewick Press. I am an Indiebound Affiliate. Just what little you have shown us here about makes me cry. That is so sweet. I miss cuddling up in the kids’ beds at bedtime and reading them stories. Just the cover and last line made me almost cry! Thanks for your presentation. The pictures look gorgeous! I have to find this one too! Awwww, this sounds so sweet! I’m a huge fan of Emma Dodd’s books. Adding this one to the tbr list. This looks and sounds like a wonderful book for children! This looks so sweet Kathy. Thanks for sharing. I can’t wait to buy it and give it as a baby gift. I know it is lovely…have you ever read the book Love You Forever….that’s a favorite, too. Ooooooooo it sounds precious. I love those tear jerkers. Awww I would pick this up just for the cover! This book sounds so lovely and I’ll definitely keep it in mind for gift giving. You have me intrigued! I think I will also be buying this book as a gift. I’m writing this title down! It sounds like the perfect book to share with my grandson! Off to see if the library has this one! ooooo must get this one for the little guy! This sounds like such a fabulous book! I definitely want to get this and read this with Laya..:) Thanks for the review! So precious!!!! I love how universal it is.